Are you ready to shake things up a bit with your kitchen cabinets? Shaker style cabinets are a great option when renovating your kitchen. Dating back to the 18th century, the Shaker style cabinetry was created by the Shakers, who defined themselves by their simplicity and craftsmanship – which shows through the style. Shaker cabinet doors are comprised of five pieces – two horizontal rails and two vertical stiles that frame a recessed panel. They’re known for their beautiful simplicity, but also for their sturdiness, which is due to the construction. They use sturdy wooden dovetailed joints in the corners, instead of glue or nails; which allows the wood to swell and contract freely. One of the many wonderful things about Shaker cabinetry is that the simple style lends itself to any décor, from country to contemporary. If you like excess details, you may want to rethink this cabinet door style in its original form. Shaker style cabinet doors will not have the trims and patterns you may find on other ornate cabinetry – just modest and practical with clean lines. However, if you like the look of Shaker style cabinets but also enjoy a little fuss in your kitchen cabinet style, there is no need to fear. Shaker cabinets can be easily spiced-up. Add some ornate hardware or a different finish to your cabinets – including stains, paint and polyurethane finishes. 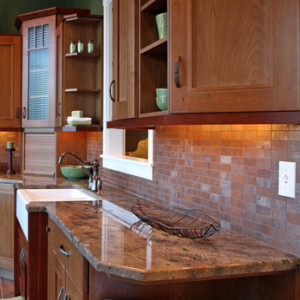 When planning a new kitchen cabinet style for your home, consider shaker style cabinets. Their minimalism and functionality make them a perfect addition to any kitchen.